In a matchup of the 2016 championships to kick off the 2017 Virgin Islands Softball-Baseball Association Harriette Skelton Fast-pitch League opener at the E. Walwyn Brewley Softball Park on Sunday night, Power Outage used homers from four different players in the first four innings, to topple defending champions Pirates, 12-5. The power surge began in the first inning with Tramore Fraser, Jeremey “Chicken” Penn in the second followed by Jamarlii James in the third and Jamal “Lefty” Allen in the fourth, as Power Outage sprayed the park for 12 hits. They had three errors and stranded five. The Pirates had 5 runs, 7 hits, 4 errors and left 8 runners on base. 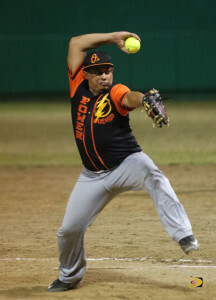 Yevris Rodriguez, 1-0, was the winning pitcher and the loser was Allen “Woodrow” Smith. James had a 3-for-4 game with a double, a home run, 3 runs scored and 3 RBI’s. Jeremy Penn went 2-for-4 with a triple, a home run, a run scored and a run batted in. Allen finished 2-for-3 with a double, a home run, 3 runs scored and drove in one. Frazer had a 2-for-4 night including a double, a home run, a run scored and 2 runs batted in. While his team is known for its hitting, Gumbs said their aim is to play a solid all round game. Smith who was chased by Power Outage in the fourth, said it was a rough start for his team. In the women’s game, Chevaunne Richardson fired a 2-hitter as That’s Ya Problem whipped defending champions Hawks, 10-0. That’s Ya Problem had 10 runs, 4 hits, 1 error and left 6 runners on base. Hawks had 0 runs, 2 hits, 3 errors and left 5 runners on base. Tamara Phillip of That’s Ya Problem finished 2-for-3 with a double, 3 runs scored and a run batted in. The Hawks’ Korrine Rodriguez, was tagged with the loss.